Marketing is a crucial part of a manufacturing organization because it connects manufacturers, wholesalers, and distributors, ensuring your product reaches its end-user. Determining the best ways to market your manufacturing company, on the other hand, can take more time and effort. In an industry that is moving toward more automation and technology, it’s surprising that marketing efforts haven’t caught up. Many companies still rely on dated practices that don’t produce results but also don’t require a ton of effort. Perhaps that’s why investing in thorough business-to-business (B2B) marketing strategies haven’t been as widespread as you’d expect. However, with better inbound marketing, such as whitepapers and lead generation, email marketing, social media, design, content, A/B testing, and SEO, among others, manufacturers can reach their goals and connect with new audiences. No matter what stage you’re at in the manufacturing marketing journey, we’ll share top trends and ideas to get you thinking. Industrial and manufacturing spheres will greatly benefit from a coordinated inbound marketing plan. Let’s discover how to implement one. Before diving deep into the specifics of how to acquire and convert leads, it’s important to consider the latest trends and how to capitalize on them. “The unique aspect of marketing in the manufacturing industry is that it is ever-changing and fast-paced. You must stay ahead of the competition and curate content that fits your end-users needs and pain points,” said Jackie Tihanyi, Digital Marketing Specialist at Fisher Unitech. Here are the manufacturing trends B2B marketers are looking toward in 2019 and beyond. 1. Influencers in the B2B segment. Influencers are not only important in the beauty and fashion spheres. Just think about it: it never hurts to have a few great reviews by the key people in the industry. Networking at trade shows, engineering forums, and even LinkedIn will bring in a whole spectrum of experts willing to educate and share their opinions online. In addition, blogging about common topics related to the business has shown tremendous success for manufacturers. These connections can result in guest posts or exchange content ideas to build both online presences. 2. Marketing automation is on the rise. “Two things will jumpstart a manufacturer’s sales pipeline and revenue: marketing automation plus content marketing. It is crucial that the sales team uses a CRM integrated with the marketing automation platform. Put this model in place and results will follow,” said Bruce McDuffee, director at the Manufacturing Marketing Group. Jump ahead to the section on CRM tools if you want to learn more. 3. Content marketing is growing exponentially. According to the Content Marketing Institute’s research, 82% of marketers in manufacturing are using content marketing effectively. 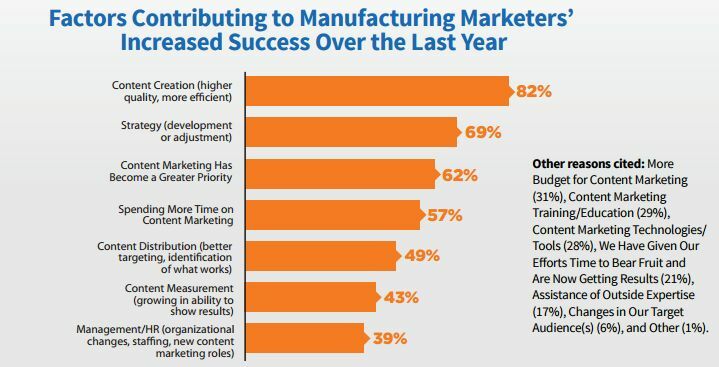 The chart below shows which tactics are currently working best, according to manufacturing marketers. This tactic should become central to the industrial marketing strategy as online collaboration is becoming prioritized over more traditional forms of marketing. And it’s more budget-friendly to produce a blog post than a 30-second TV spot, so if you’re looking to test tactics before diving in, this is a good place to start. 4. Budgets are shifting toward online. Some marketing tactics have lost their appeal. Brochures and print ads have a limited reach but online marketing can be targeted more directly to your audience. Looking at the factors contributing to manufacturing marketers’ increased success, 82% of respondents credited content creation (see chart from Ironpaper below). Is it time to incorporate content into your marketing plan? 5. The pace of online is only expected to increase in 2019. The use of digital marketing for manufacturers is definitely in its growth stage. As the maturation of digital manufacturing marketing is becoming closer, digital is gaining a more mundane meaning in manufacturing and engineering. A boost in robotics, AI, and the Internet of Things is a vivid indication that digital is the way to go. Now that you know where the industry stands, what the trends are, and what your organization’s goals are, it’s time to create your manufacturing marketing strategy. First, it might help to know where you stand in terms of marketing maturity. This chart applies to content marketing specifically but can be considered in terms of general marketing efforts. The good news is that even in the “first steps” stage, all the data and research a manufacturing company already has on hand can be used for lead generation and digital marketing, with the help of a smart organizational tool. There are likely existing processes or tools you can start utilizing right away. With that in mind, here’s your step-by-step guide to creating a successful marketing plan. To build your marketing plan, first take a look at your resources. Everything from printed brochures to customer insights will aid in answering this first set of questions. A complete audit of the existing manufacturing marketing data should be compiled and analyzed. What assets do we have available? What branding and materials need to be created? Which tactics have proven the most successful? Which approaches can we skip this year? Building a customer persona — a typical representative of the target market — is crucial for successful manufacturing marketing. Higher conversion is guaranteed only when content is targeted. That is, crafted for a certain marketing persona. For manufacturing marketing, and especially B2B, this means establishing connections and partnerships, which may happen through reaching out and interviewing your top customers. “Our first suggestion to manufacturing clients is to generate a buyer persona in order to reach their ideal clients,” explained Brian Winum, digital marketing director at MAXPlaces Marketing. What you want to say is important, but who you are talking to should be nailed down before you roll out a marketing plan. There is no use in targeting a wider audience, which actually creates non-organic traffic. Adam Clark, CEO of Tangible Solutions, explains establishing a focus as a way to make sure your efforts are well invested; something he’s learned while marketing his manufacturing company for the last six years. “The first thing marketers need to do in the manufacturing sector is really, really, really identify a core focus. Energy can be dispersed so quickly if you’re speaking to a broad audience. It’s okay if people don’t ‘follow’ you. That’s actually what you want — you want to turn away people who are not your ideal customer,” Clark explained. Now that you’ve laid the groundwork for your marketing efforts, it’s time to make sure you’ve covered the basics of marketing. If the website is already set up, consider adding some interactive forms to engage visitors as well as gather some lead data. Unbounce, HubSpot, or just WordPress can help do this easily. You’ll also want to optimize your SEO efforts, which will be covered in the following section. Start from a scratch. It may seem like a hurdle, but with the digital tools out there, it won’t take long to get your site up and running with base-level information. Growth-Driven Design (GDD) is probably the most modern tool that may help manufacturing marketing achieve its goals. Plus, it offers some custom built-in A/B testing tactics. No matter which approach is chosen, the call-to-action (CTA) is essential, just like fillable forms. These are the best ways to track down prospects and potential partners among all the targeted traffic on your website. For inspiration, check out these 30+ CTA examples from Hubspot. Whatever changes you want to make to your site or CTAs, consider A/B testing so you can get to the results faster. Now that your website is in place, it’s time to build on it and generate some engagement. A wide spectrum of digital tactics may be used, but the following are the most popular approaches to lead generation. Search engine optimization (SEO) is key to getting quality visitors, or organic traffic. SEO includes crafting headers, text, as well as web page addresses to help the search engines understand the goal of the website and who may be interested in it. SEMrush is a tool that allows comparing the business to competitors in the digital world. With a tool like SEMrush, you can explore your site’s top keywords, main competitors, backlinks and more. PPC (pay-per-click) is used for increasing paid search results rankings. Primarily thought of as paid search ads, PPC tactics can help you get your name at the top of search results by bidding on keywords. There are very simple Google AdWords campaigns for that. Creating a blog for your business is a great way to drive more interested individuals to the website with useful tips, descriptive articles, video content, and infographics. It is also a tool that can help demystify what you do and better connect with audiences. You can explore topics such as technology and automation, and explain how it can improve production processes and human lives, in general. Simple tools like AnswerThePublic can be used to find long tail keywords for a blog post. Referencing the buyer persona, “We’ll work on implementing some form of a content marketing program that leverages their industry knowledge and demonstrates their expertise. Things like case studies, infographics, videos, and white papers work well for this,” Winum said. However, don’t limit yourself just to a blog. There are a variety of content marketing approaches you can test out, including email courses and webinars. Infographics and video content are considered some of the highest converting content out there. Some adjustments will need to be made to the format, but the core materials are already at hand. This will allow for some A/B testing by putting up different materials for varying audiences and comparing the outcomes. Social media is booming, even in the manufacturing sector. However, the key decision is going with the right platform. While Facebook has a broad audience, it’s not always the best option for B2B. Twitter and LinkedIn, on the other hand, are great sources for B2B networking. Tools like Hootsuite can streamline and schedule social media content for a manufacturing company. “For cost and scalability, I recommend marketers utilize a mix of Hootsuite (for digital scheduling), Salesforce (for reporting and analytics), and SAP Business Objects (for BI),” said Benjamin van Loon, integrated communications consultant and educator. Email marketing allows companies to share valuable content and offers with prospects, which can be a great source of traffic and engagement. With so much contact data available online already, reaching out to your target audience is even easier. Use your newly developed content marketing to acquire emails and then follow-up with related updates or info. Manufacturing email marketing can be streamlined with tools like Stripo. 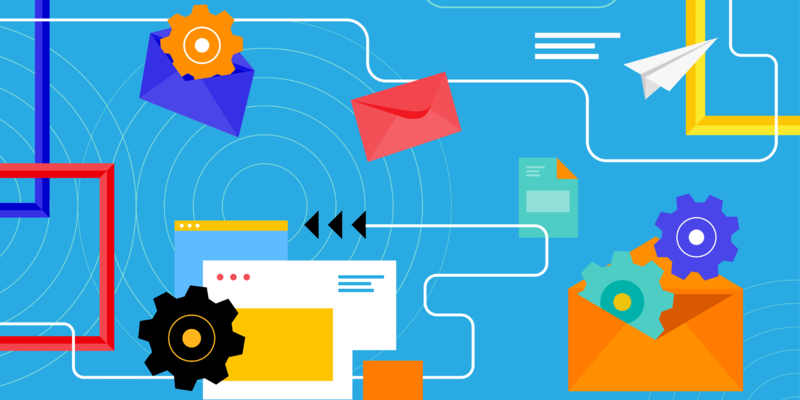 “The most valuable connection you can make with your end customers is their email address, and nurturing the email relationship. After acquiring the email address, evolve into further communications by old fashioned postal direct mailing as a means to break through the online clutter,” explained Patrick Pitman, president of E-business Coach. Your efforts are only as valuable as the results they bring. How do you know if your marketing strategy is working? “We use analytics tools such as Google Analytics, Semrush, and Ahrefs to stay ahead of the competition and help us strategically plan our marketing campaigns,” Brian Sheehan, marketing and sales manager at Hollingsworth. Trying a variety of tracking and metrics tools will give you a clear picture of how your marketing tactics perform. In addition, having a Customer Relationship Management (CRM) system is recommended for all online businesses. In B2B, it may look a bit different but it’s still a place where all leads can be stored and evaluated, and then better email campaigns built. “Customer relationships are long and ongoing, and need to be constantly nurtured and managed. A lost account can be worth millions of dollars, and very difficult to get back. Marketing is more focused on retaining and growing share of wallet with customers, than on generating new one,” explained Per Ohstrom, an industrial B2B marketer. It’s good to have a lot of organic traffic but conversions happen only with a great CRM tool. Salesforce is a very useful tool for manufacturing marketers. Digital storytelling in manufacturing dehumanizes the company by telling real stories, often from the HR perspective, of their employees and partners, using various social platforms. Personalization is key in manufacturing – such as phone and video communication. Manufacturing is a serious business and a few tweets here and there won’t do the trick. To get a reliable partner, there is still a necessity to rely on face-to-face communication which must be nurtured via online means. Going digital does not mean giving up all traditional. Marketers can use a retail data and analytics tool to level up their efforts. These tools help marketers automatically collect, clean, and harmonize the detailed sales and inventory data they need from retailers, and deliver insights at the product and store level to understand the impact of marketing activities. More advanced tools can also forecast future consumer demand, so marketers can determine when/where they need to plan marketing activities, such as promotions, to meet sales targets. As we all know, change isn’t easy. It’s likely you’ll need to overcome resistance at some point, as many manufacturers continue to rely on personal networks instead of relying on digital tactics for outreach. However, the effort is worth it. Especially when you consider that most people start the purchase process for anything in a similar way: through online search. “Overcome it just like any other big resistance to change; test a new concept, prove the results and communicate the results to the team,” McDuffee explained.